I want to make another Swoon quilt. The two I have made were gifts and I want one for me. I can't make up my mind on what fabrics to use or how I want them to look. I think I am over-thinking the whole deal. 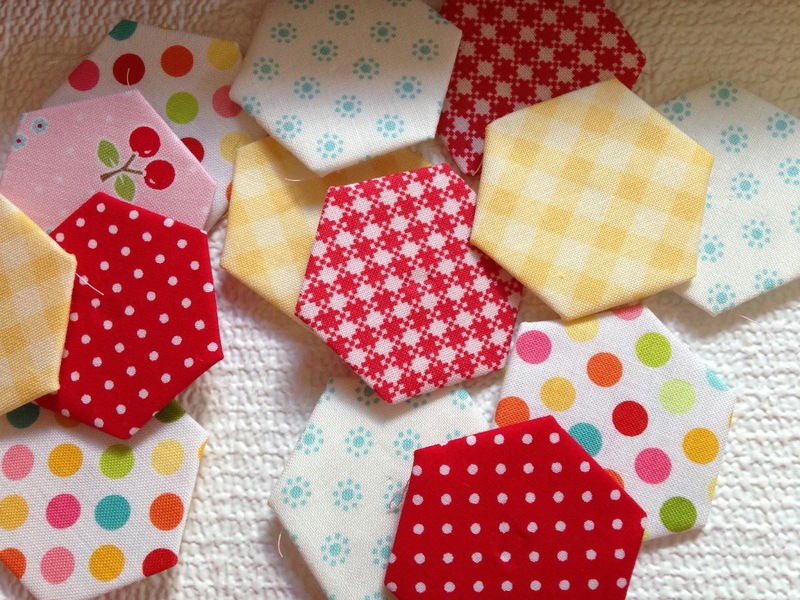 In the mean time, I got out my old hexies and worked on them. But I got bored. Why? I wasn't using fabric I loved. So I put them away, got out scraps and cut into yardage to use fabric I did love. It hasn't taken long for me to use all my templates! Now to start putting them together. =) I have no plan. Just having fun. I want to make a swoon quilt too. I have pam kitty morning fabric for mine. I haven't started mine I guess because I'm going to have to make a king size for my bed. I love hexies too but just can't start that project either! I love to make hexies, so relaxing! and even more fun with fabric you love. I look forward to seeing what they become. Can't wait to see what you pull together for your own Swoon. I love the polka dots you have in that pile. The joy of fabric love and hexies! Great hexies! Have you seen the new line by Moda called Scumptious? I love the colors and am itching to get my hands on some. You are right about working with fabric you love. Most UFOs are because people were working with fabrics they weren't committed to. Your hexies are lovely! Love your fabric for those hexies! I am finishing up a hexie quilt - a vintage Grandmother's Flower Garden, called Martha Washington's Flower Garden, and then I am planning to start another one with hexie's. It is so relaxing for me, and easy to take places. Your fabric choices gave me new inspiration! I love the fabric you have chosen. I love those fabrics and colors. They are cheerful and bright and at the same time, for me, they are a connection with the past; so they have a sense of nostalgia that makes them sweet too.